Azerbaijan’s Defense Minister Colonel General Zakir Hasanov held an extended official meeting with the command staff of the Azerbaijan Army on September 29 in the Central Command and Control Post. 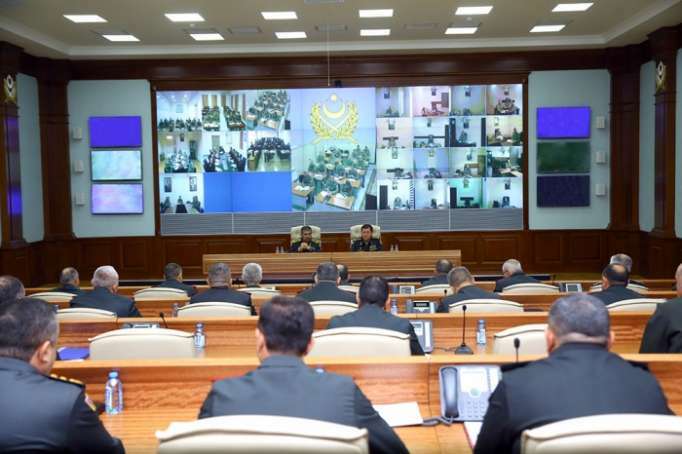 The meeting also involved the commanders of the formations stationed in the frontline zone, as well as other officers via video communication, the Defense Ministry reports. The defense minister brought to the military personnel the tasks assigned by the President of the Republic of Azerbaijan, Supreme Commander Ilham Aliyev to the Azerbaijan Army and after analyzing the latest situation on the line of confrontation of troops, gave relevant instructions in connection with the focusing on better organization of combat duty, as well as wide use of special technical means to maximize the safety of military personnel. The minister also instructed to complete the preparatory work for the winter period, as well as the combat and logistical support of military personnel, taking into account the features of the mountainous terrain. During the meeting, Hasanov set specific tasks for officials to organize work with young soldiers, increase the fruitfulness of individual and educational work, to intensify theoretical classes conducted at simulators and training centers, analyze the activities of an extended serviceman and to conduct competitions on various specialties.